I originally bought the Nik plugin package solely for Silver Efex Pro and then - when seeing there were other options that I might use - I got this kindle book as well as its companions, thinking that I would possibly get round to using at some time. Then the online course that I am undertaking started to introduce sharpening in one of the modules and I took the plunge of investing time - given a good initial experience with the companion Silver Efex Pro book. The book is simple and fits in well with the previous read, with style and layout being familiar. My first attempt, albeit clumsy in comparison to the excellent included worked examples was simply stunning. The 24MB landscape holiday image that was well focused, with a sensible histogram and pleasing "in-camera" result, (which I felt pretty proud of upon capture - you can just tell can't you!) was transformed into a sharp, almost 3D-like picture - and a quantum leap in quality - and all done at the airport on my laptop whilst waiting through the 2 hour weather delay for my flight. An easy, but succinct, read, well worth the small investment of money and will be referred to frequently in the months to come as clumsy attempts become more refined. Recommended. 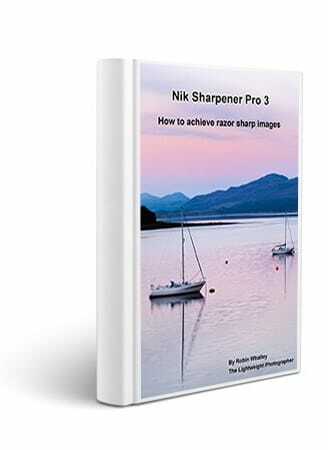 This book covers Nik Sharpener Pro 3. A significant but often overlooked element of how we impress others with our photography is image sharpness. It used to be that your images just needed to be in focus but this is no longer sufficient in today’s digital world. Your images need to be razor sharp and packed with detail, whether displayed on the screen or in print. Without the correct level of sharpness your work will just fail to impress and blend into a sea of mediocre photography. Effective and correct sharpening will reveal the true beauty of your images. Fine detail will become evident, giving your photographs depth and realism. You can even use sharpness (and blurring) as a tool to control how people examine and perceive your images. By sharpening your images properly you can add an extra dimension of interest for those viewing your photography. But how do you go about correctly sharpening your images without adding too much? This book provides answers using Nik’s superb Sharpener Pro tools. How to use the Nik tools as part of a comprehensive, industrial strength sharpening workflow to achieve super sharp images with minimal problems. The difference between the RAW Pre-sharpener and Output Sharpener tools, which to use in what circumstances and how to avoid introducing problems through incorrect sharpening. Selective blurring and sharpening techniques to influence subconsciously the viewer’s perception of your work. How to apply the correct level of sharpening for output to print or for screen display. How to use all the elements of the Sharpener Pro interface to make your adjustments easier and quicker. How to understand common sharpening problems and avoid them. And there is more, all backed up by two full comprehensive case studies for which you can download high resolution images to practise your new skills.